I love receiving photos from christenings. It gives me a big buzz seeing my unique gowns on display ! 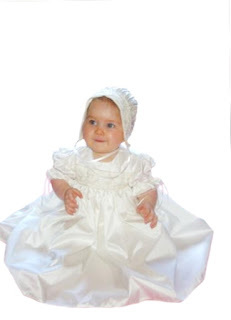 This is a short sleeved version of christening dress LUCY . The fullness of the gown is amazing ! The look on baby C. 's face is priceless !!! What a gorgeous girl !!! What a beautiful baby! Your gown is lovely. Beautiful work! Your gowns are gorgeous! I would be fine with you adding my blog to your blog roll. I added you to mine. I have a couple of gowns that will be posted on in June. They have been made since Christmas but the Christening is in June, so pics coming then. I hope you enjoy the pics of my antique laces. I have quite a few to post. Your passion for sewing shows in your beautiful work. I certainly know what you mean about sewing being your meditation. Currently I am working on a picture smocked insert for DGS. As you can tell from my blog though, I do all sorts of sewing. Glad you enjoyed it.